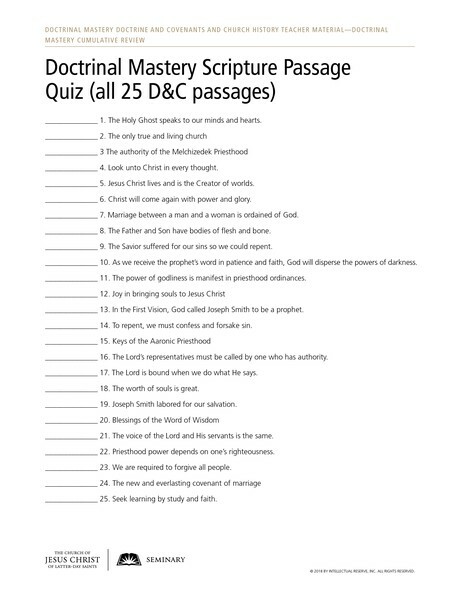 In this review activity, students will study all 25 of the doctrinal mastery scripture passages in the Doctrine and Covenants and they will take a final quiz. Explain to students that knowing the scripture references to the doctrinal mastery passages can help them as they teach the gospel to others and seek to find answers to questions. Prepare students for a final quiz on the 25 doctrinal mastery passages they have learned throughout the course. You might do this by assigning students to work with a partner. Invite the partnerships to use their copies of the Doctrinal Mastery Reference Guide to study and review the doctrinal mastery passages they have studied during the school year, along with the accompanying key phrases. After sufficient time, students can quiz each other by stating the key phrases to see if their partner can identify the correct doctrinal mastery reference. After both partners have had the opportunity to be quizzed on the scripture references, invite them to quiz each other by having one student state the scripture references while his or her partner states the key phrases or explains the scripture from memory. As an alternative to this activity, if students have electronic devices, consider allowing them time to download the LDS Doctrinal Mastery app. The LDS Doctrinal Mastery app is free and available for all mobile Apple and Android devices by searching for LDS Doctrinal Mastery in the App Store (Apple devices) and Google Play (Android devices). After students have downloaded the app, consider giving them some time to work with the flash cards and quiz activities in the app. Administer a quiz on the 25 doctrinal mastery passages and their corresponding key phrases. You could administer this quiz verbally, or you could administer it in written form by listing the key phrases and allowing students to write the associated scripture references. You might use the accompanying handout. ______________ 1. The Holy Ghost speaks to our minds and hearts. ______________ 4. Look unto Christ in every thought. ______________ 5. Jesus Christ lives and is the Creator of worlds. ______________ 6. Christ will come again with power and glory. ______________ 7. Marriage between a man and a woman is ordained of God. ______________ 8. The Father and Son have bodies of flesh and bone. ______________ 9. The Savior suffered for our sins so we could repent. ______________ 10. As we receive the prophet’s word in patience and faith, God will disperse the powers of darkness. ______________ 11. The power of godliness is manifest in priesthood ordinances. ______________ 13. In the First Vision, God called Joseph Smith to be a prophet. ______________ 14. To repent, we must confess and forsake sin. ______________ 16. The Lord’s representatives must be called by one who has authority. ______________ 17. The Lord is bound when we do what He says. ______________ 18. The worth of souls is great. ______________ 19. Joseph Smith labored for our salvation. ______________ 21. The voice of the Lord and His servants is the same. ______________ 22. Priesthood power depends on one’s righteousness. ______________ 23. We are required to forgive all people. ______________ 25. Seek learning by study and faith. Answers to the quiz: 1. D&C 8:2–3; 2. D&C 1:30; 3. D&C 107:8; 4. D&C 6:36; 5. D&C 76:22–24; 6. D&C 29:10–11; 7. D&C 49:15–17; 8. D&C 130:22–23; 9. D&C 19:16–19; 10. D&C 21:4–6; 11. D&C 84:20–22; 12. D&C 18:15–16; 13. Joseph Smith—History 1:15–20; 14. D&C 58:42–43; 15. D&C 13:1; 16. D&C 42:11; 17. D&C 82:10; 18. D&C 18:10–11; 19. D&C 135:3; 20. D&C 89:18–21; 21. D&C 1:37–38; 22. D&C 121:36, 41–42; 23. D&C 64:9–11; 24. D&C 131:1–4; 25. D&C 88:118.
Review the quiz as a class. After you review the quiz, you might provide an opportunity for students to take the quiz again if they would like to improve their scores.